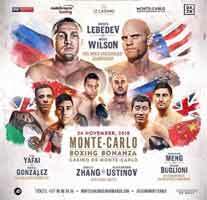 Review by AllTheBestFights.com: 2018-11-24, pretty good fight between Khalid Yafai and Israel Gonzalez: it gets three stars. The undefeated former Olympian and Wba super-Flw champion Khalid Yafai entered this fight with a perfect boxing record of 24-0-0 (15 knockouts) and he is ranked as the No.5 super flyweight in the world (currently the #1 in this division is Srisaket Sor Rungvisai). In his last three fights Kal has won over Suguru Muranaka (Yafai vs Muranaka), Sho Ishida (Khalid Yafai vs Sho Ishida) and David Carmona (Khalid Yafai vs David Carmona). His opponent, Israel Gonzalez, has a record of 23-2-0 (10 knockouts) and he entered as the No.45 in the same weight class. He has already fought three times in 2018 losing to Jerwin Ancajas (Jerwin Ancajas vs Israel Gonzalez) but then he has defeated Jairo Gutierrez and Daniel Arturo Vega. Kal Yafai vs Gonzalez is valid for the WBA World super flyweight title (Yafai’s fourth defense); undercard of Denis Lebedev vs Mike Wilson. Watch the video and rate this fight!